Many years ago, oh way back when God was but a lad, in the sun kissed streets of Italy, a trendy modern artist called Leo painted portraits for a living. He was really rather good at it and hundreds of years later is still remembered for his fabulous work, especially one of a lady with a funny look on her face, Mona someobody, can’t really remember offhand. Anyway you might have heard of him, Leonardo Da Vinci. Well that moaning minnie with the funny smile wasn’t his only masterpiece you know. 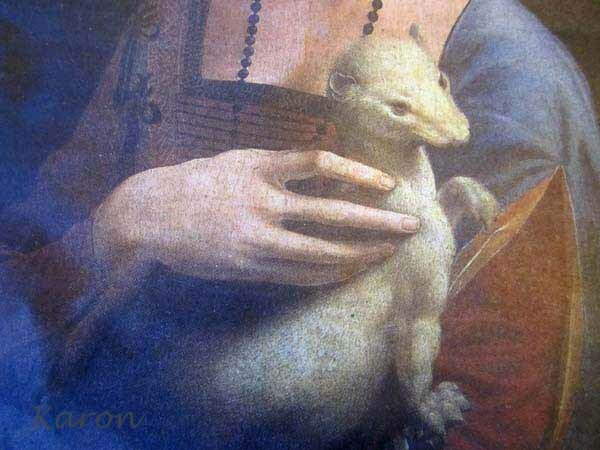 This ace of the artworld is also responsible for creating what can only be described as the most famous ferret feature of all time – “The Lady With An Ermine” – okay so it’s an ermine, let’s not split hares (sorry couldn’t resist) here! 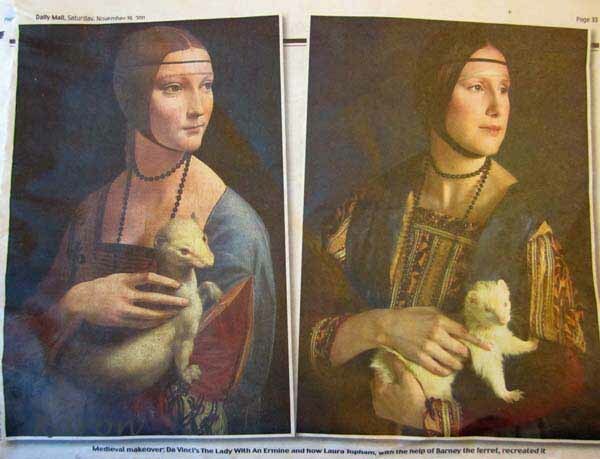 Last week the Daily Mail did a great piece in their Saturday edition about how they recreated Da Vinci’s painting using a model, a ferret and a camera. The results are pretty good and I enjoyed the model’s take on the whole thing and how uncomfortable the pose was, the constrictions of the clothing etc. 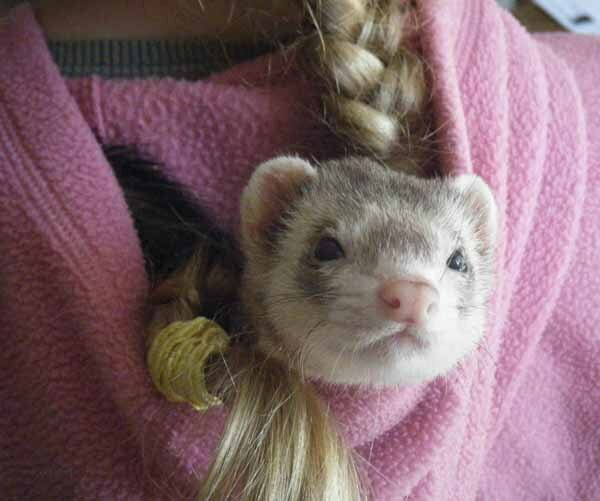 But most of all of course I loved the info on the ferret. 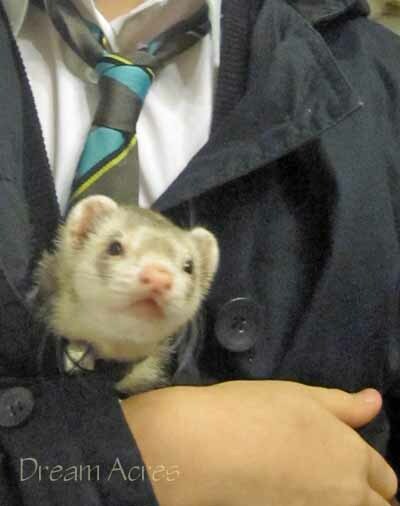 Apparently they had hired four ferrets for the shoot, and of course being non-ferret people they were highly nervous and skeptical about these furry friends. Oh the bad press weasels types have had over the years. Really they ought to get a good PR company behind them and get a new image. 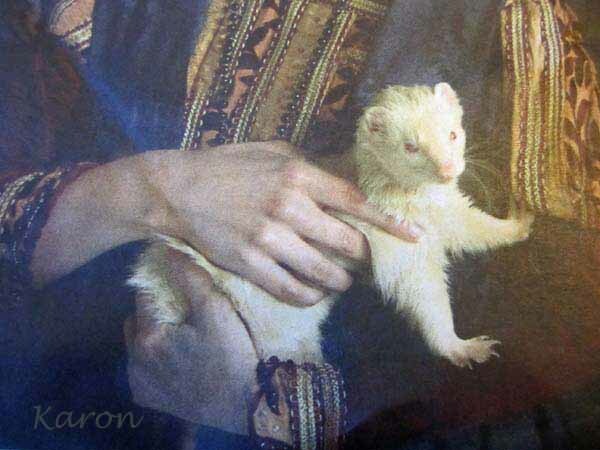 Anyway they finally settled on Barney a blind albino ferret who settled quite happily into his pose and has now been imortalised in print as the moddern day version of ‘Lady with an Ermine’. 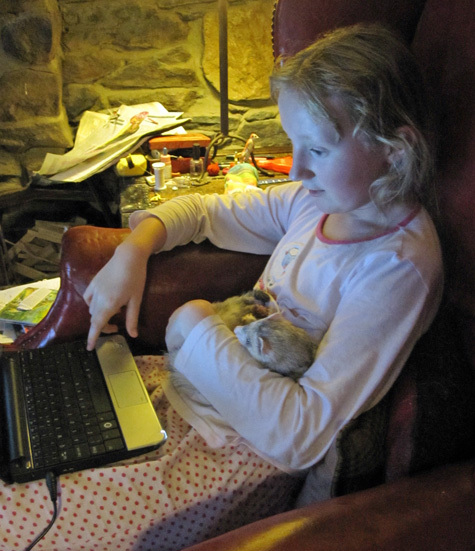 And the somewhat atmopheric and slightly romantic ‘Girl With Laptop And Ferret Friend’. But the true classics in modern artistry must be ‘Harry in The Hoody’, gets me every time. Idgy in the ‘Girl with Laptop and Ferret’ is as beautiful and enigmatic as any portrait by Da Vinci – gorgeous. 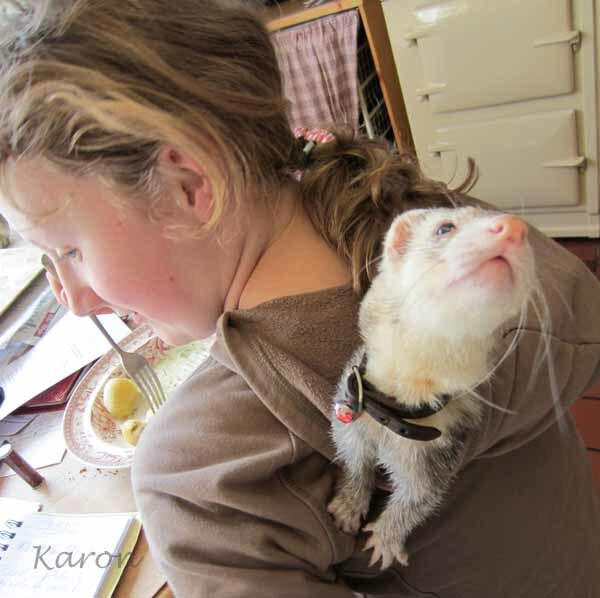 And please don’t show my cats that hoodys can be used as cosy retreats…..I’ll never get any peace. 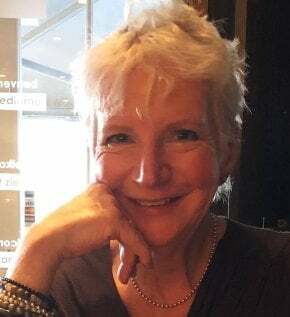 Thank you so much for sending the books so super quick, Mum gets hers today, she’ll be thrilled. So when do the portarits go into a gallery? Is Harry demanding a model’s salary? Will Idgy get her own trailer on photo shoots? Idgy already demanding own Pringles (what not sharing! ), Harry listed a motorbike but not sure he realises his length (or lack of ) legs might be a problem. Trying to palm them off with a packet of crisps and a can of coke. Once they have reached the Tate or possibly The Louvre they can advance to the Pringles and vehicle.